I could have easily become a picky eater. I am compulsive in so many ways . . . the way my glass has to be completely clean or I won’t drink from it, the way I hate to get my hands dirty, the way I have to brush my teeth before my shower, not after. I can’t tell you how glad I am that I like all foods. There’s not much I won’t try, and once I’ve tried it, not much I don’t like! Except beets . . . ew, beets. I wasn’t always so open to food. I was never picky, per se, but I had my list — like many kids — of things I didn’t like. Tomatoes, onions, lima beans, olives, bananas, and coconut. I hated coconut! What was wrong with me? Looking back, I think my aversions were almost always related to texture. Lima beans and bananas are oddly smushy. Shredded coconut just feels weird . . . too many paper-like pieces in your mouth, I guess! Anyway, I’ve heard people say that their tastes “gradually” changed as they got older . . . well, mine usually change instantaneously. It’s an odd and wonderful phenomenon. For instance, last year I was driving home from school and realized I wanted sushi, something that until that moment, I was relatively sure I hated. I picked some up, enjoyed every bite, and have enjoyed it ever since. The same thing recently happened with olives and lima beans . . . and coconut! All of a sudden it hit me that light, sweet, wonderful COCONUT, when combined with milky or creamy flavors, was one of the best tastes in the world. I’m hooked. Mike loves coconut too, thank God! After making him two birthday dishes that included ingredients he wasn’t too keen on (smart choice), I needed to hedge my bets. This gorgeous tart was a sure thing. 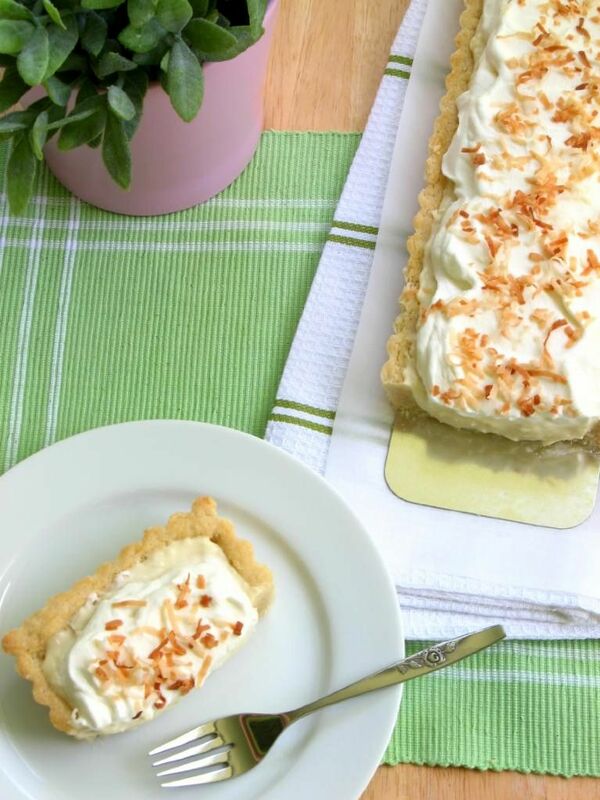 It has all the appeal of a coconut cream pie with an even better texture. The coconut pastry cream is thick, rich, buttery, and altogether one of the best tasting things I’ve ever put in my mouth. 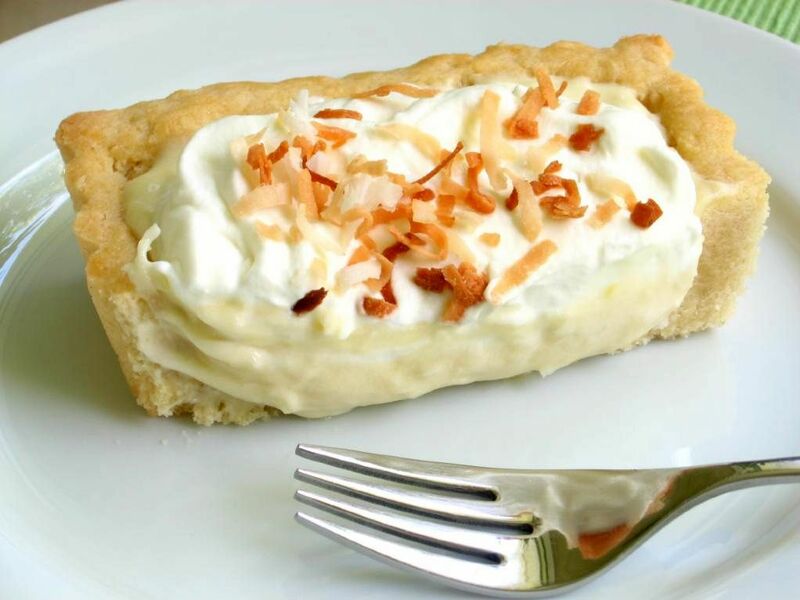 I filled my favorite buttery, flaky tart shell with it and topped it with lightly sweetened whipped cream and toasted coconut. Mike actually liked the Chocolate Tart better, but I’m voting for this one all the way! 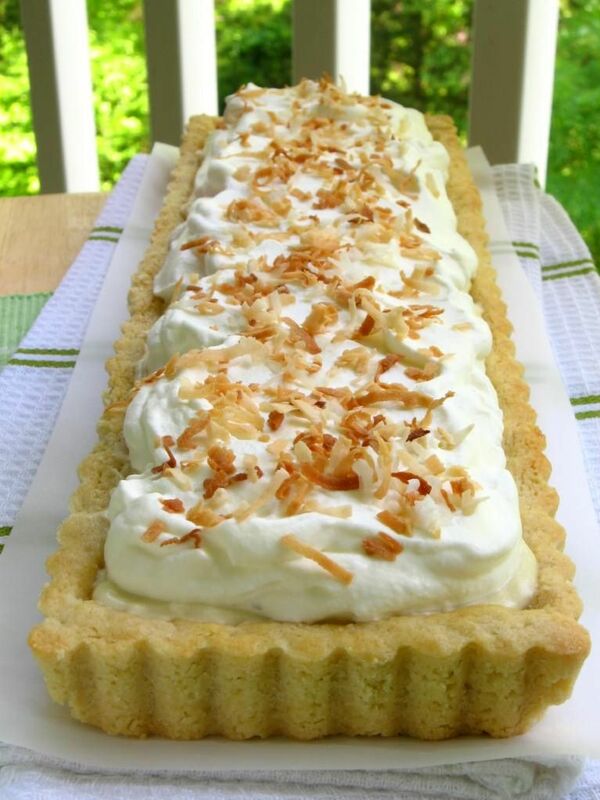 Coconut fans (and even those who don’t think they’re coconut fans) have to whip up one of these tarts. It’ll work just the same in a round tart pan, but this rectangular tart pan was only $18 at my Williams-Sonoma if you’re into corners. Even though the recipe below makes enough pastry cream to fill two tarts, feel free to just make one tart shell — I have another amazing recipe coming up shortly to use the extra pastry cream! To make the pastry: combine the flour, sugar, and salt in a large mixing bowl (or food processor). Add the butter and mix with a processor or hands until the mixture resembles coarse crumbs. Make a well in the middle of the pastry. Combine the egg yolk with the ice water in a small bowl, whisking to blend; pour it into the well and work it in to bind the dough until it holds together without being too wet or sticky. Squeeze a small amount together, if it is crumbly, add more ice water, 1 tablespoon at a time. When the dough is coming together but still in crumbs, pour the crumbs into your tart pan and press them out to fill the pan. Press them up the sides evenly and trim off any excess. Dock the dough (prick it slightly) with a fork all over. Put the tart shell in the refrigerator for at least 15 minutes to relax. Preheat the oven to 350 degrees F. Place the tart pan on a sturdy cookie sheet so it will be easy to move in and out of the oven. Line the tart with aluminum foil and add pie weights or dried beans to keep the sides of the tart from buckling. Bake for 30 minutes, then remove the foil and weights. Using a pastry brush, lightly coat the crust with a beaten egg white. Return to the oven and continue to bake for another 8 minutes until the tart is golden brown. Let cool completely before filling. To make filling: Heat the coconut milk, sugar, salt and vanilla bean in a medium saucepan over medium heat. In a bowl, whisk together the egg yolks and corn starch. Once the cream is hot, remove the vanilla bean, scraping out any remaining seeds and returning them to the cream. Add 1/2 cup of the hot cream slowly to the yolks, whisking as you add. Then pour the yolk mixture into the pot of hot cream and whisk. Continue to whisk with heat on medium-high for 3 more minutes. The mixture will turn thick and bubble. You need to continue to whisk for the full 3 minutes or the pastry cream will separate once it is cool. After the 3 minutes, whisk in the butter. Add the coconut flakes. Pour into a shallow dish to cool. Cover with plastic wrap pressed right against the pastry cream. This will prevent a thick skin from forming on the surface. Refrigerate for at least an hour or freeze for 30 minutes. Once it is cold, stir the pastry cream to loosen. Whip the 1/2 cup cream to medium peaks. Stir in 1/3 to the pastry cream to lighten. Fold in the remaining cream until the pastry cream is nice and light. When tart shell is cool, fill it with pastry cream. To make whipped cream, beat all ingredients together until whipped cream reaches medium peaks. 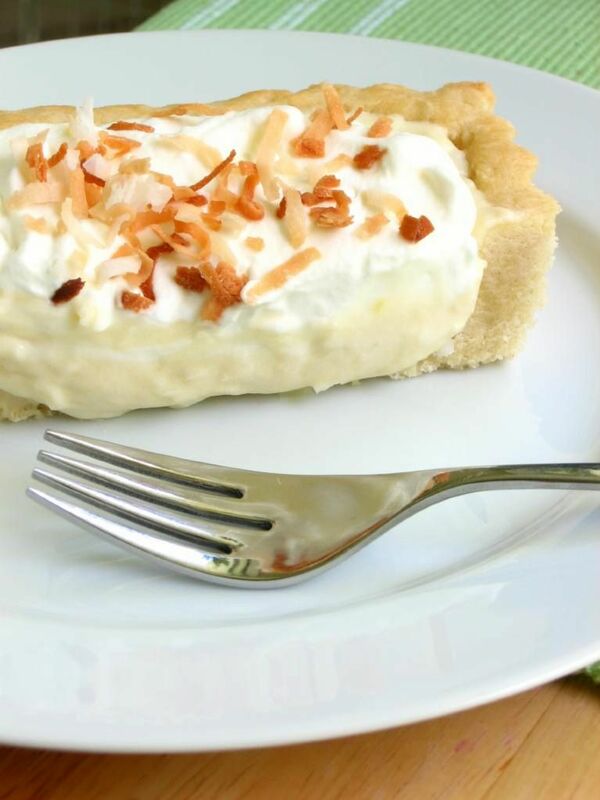 Pile onto coconut pastry cream filling and top with toasted coconut. *NOTE: This recipe makes enough pastry cream for two tarts, so you can double the tart shell recipe if you want to make both. If you only want one tart, leave the tart shell recipe as-is and use your leftover pastry cream for something fun! P.S. Not to oversell this weekend’s upcoming recipe, but um . . . it’s the best dessert I’ve ever eaten. Yeah. That has to be the most beautiful dessert I have seen in long time! I can almost taste it, it looks so good! Can’t wait to try the recipe! Thank you, Denise! You will love it! So yummy! Beautiful pictures! That looks absolutely delicious! I definitely did used to be a picky eater, but like you just kind of woke up one day and was like. Huh. Maybe I like fish. And tomatoes. And sweet potatoes (WHOA do I love sweet potatoes.) This tart looks fantastic! I’m so glad you cooked something that the boy ended up liking! How beautiful – with the billows of cream and the long rectangular tart tin! I now must make one the same. Thanks, Heather! Hope you enjoy! You’ve convinced me that I need a tart pan…ASAP! I love coconut and can’t wait to make this, especially if it’s the best you’ve ever had!! My tart pan was the beginning of so much joy, Natalie! 😀 Actually, my upcoming recipe was the BEST I’ve ever had, but this was close! P.S. Look what Joy the Baker just posted! A tart pan giveaway! Mmm. coconut cream. This looks luscious so I can’t imagine what you’ve come up with that could be better. There’s somethin’ about those corners, man! 🙂 Thanks, Monica! Have you tried golden beets or Chioggia beets? You might like them.. they’re not as earthy tasting. This tart is gorgeous, and I really want one of those rectangular pans, and I’m so shocked that you were able to get it for $9 at Williams-Sonoma. I feel like it’s impossible to get a pan there for that price… I’m going to have to go shopping this weekend and check for it! Oops! I checked because on second thought, that seemed odd to me too. The rectangular one was actually $18 — it was my regular round pan that was $9! I’ll change that! Ha ha. I actually went to Williams-Sonoma today. There was a rectangle one for $24, and I almost got it, but then I talked myself out of it. I have a feeling I’ll buy one soon though! Oh, it’s only $18 online! I bet shipping would ratchet it up, though! What a beautiful tart! Simply gorgeous & perfect looking. 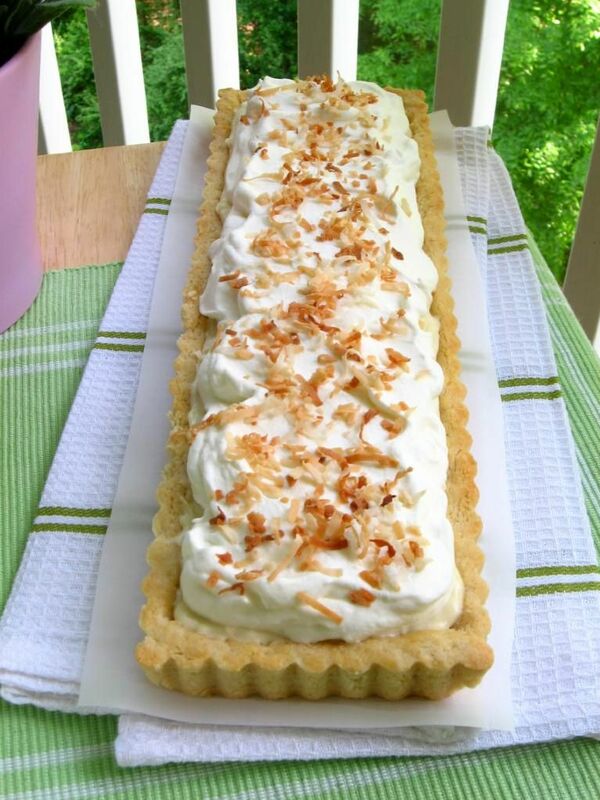 I love coconut desserts but I’m the ONLY one in my family who does…..so I never make them because I certainly don’t want to be the ONLY one who eats it! Actually, I have a recipe that uses the leftover coconut pastry cream coming up, and even my roommate (who HATES coconut) loved it! There’s hope for your fam! I love coconut! I wish my family did..so i could bake more recipes 🙂 Your tart looks super yummy! This tart looks beautiful! How long does the tart last? If I made it Wednesday and brought it to work on Thursday would the bottom crust be soggy? Thanks, Jessie! I think it would still be great. I usually make my desserts Friday or Saturday and eat them through Sunday. This one was made on Saturday and when we ate it Sunday night for dessert, it was still fantastic! You definitely can! It would be delicious! OMG! I’m a HUGE fan of coconut! This looks delicious! Thanks for posting! the CLOUDS of coconut cream here look amazing! love how they’re piled on top of the tart. Thanks Lorraine! I was weird about fish when I was younger too — so glad I’m over that now! All I can say is, Oh my! (Gotta have this)! I blew it! It’s not coconut CREAM pie he loves, it’s coconut CUSTARD pie. I’ve looked for a recipe but nothing jumps out saying: make me, I’m the one! Do you have a recipe or a place I can look? Yay! So glad you enjoyed it, Lopez! Thanks for letting me know. Have you tried to put the coconut pastry cream inside an ebelskiver? That’s why I’m looking for a coconut pastry cream. Since you got your tart pan at William-Sonoma, you can also get the ebelskiver there as well (though I’ve seen them cheaper on Amazon). They are little filled pancakes. I was also thinking a thin pineapple icing to go with it or a blueberry sauce! Whoops! I meant you can get the ebelskiver PAN at William-Sonoma. I believe the brand is Nordic Ware. 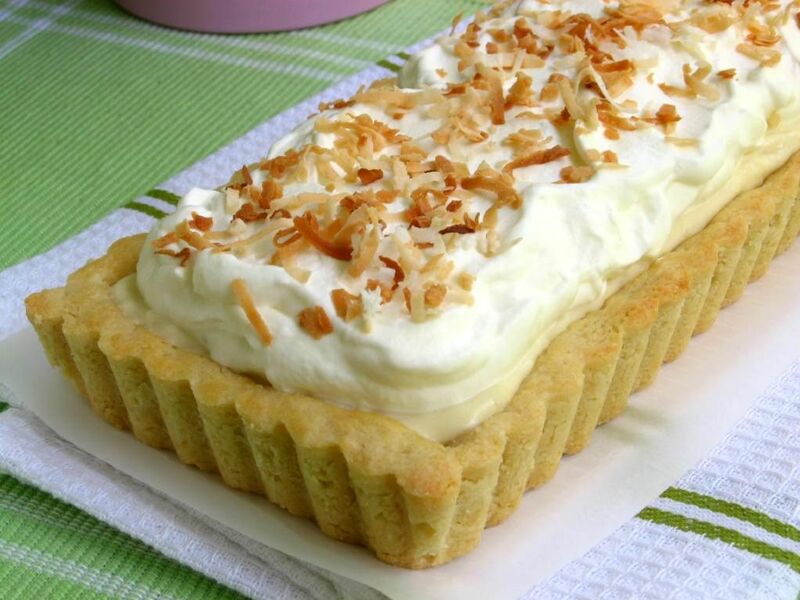 I am making the Banana Coconut Cream Cakes today. On a whim, I had bought mini bundt pans many moons ago, and have yet to find a good recipe for them. Voila!!!! I think I will make this recipe with the remaining pastry cream. I can SO relate to acquiring tastes for things once thought of as repugnant. When I was young, just the sight or knowledge of onions going into a dish made me run. I hated, hated, hated them. NOW…I absolutely love the smell of raw onions, the smell of onions cooking, the taste of any onions, red onions, green onions, yellow and white. Love, love, love. 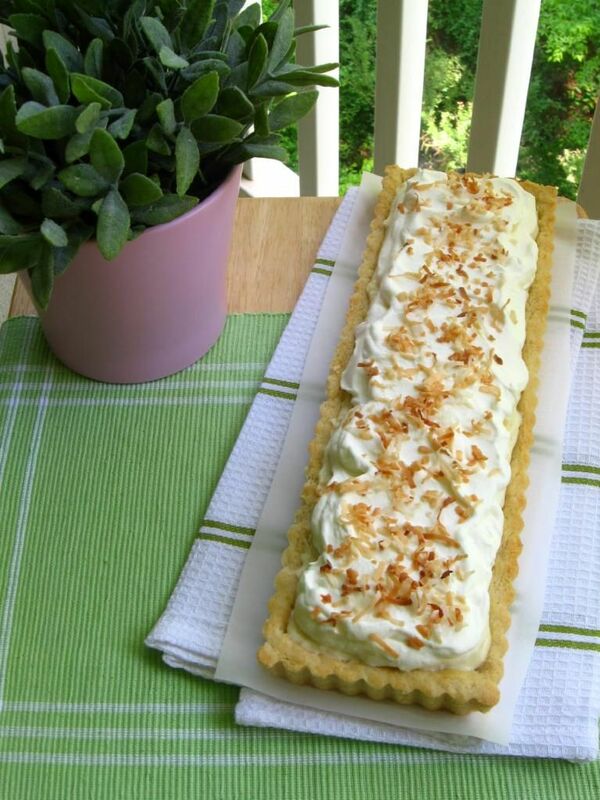 I am posting your coconut cream tart on my new blog later today. Your blog is terrific with beautiful pictures and delicious recipes. I’m dying to make this later this afternoon and will be trying my crust from scratch. Wish me luck. Best of luck, Lanell!! You can do it! Let me know if you have any questions! Oh…my…word!!! That looks AMAZING!!! I just want to stick my face in and EAT :)!!! LOL. Thank you so much for posting this…I am going to try it soon!!! Thanks, Amy!! I hope you love it! I want this right now! Can’t wait to try it, love the all-coconut post! Love the pics! I wanted to make a vanilla cake with coconut pastry cream. Came across your recipe and folded in some crushed pineapple. It was absolutely delish with the cake! Thanks! That sounds so yummy! I’m so glad you enjoyed it, Nikki!